The neo-classic style applied to armchairs Louis XVI and in chairs Louis XVI. Raising the decorative directory appropriate for the style, armchairs Louis XVI and chairs Louis XVI distinguish themselves from the previous time thanks to the shape of feet. The return in the straight line is the main characteristic of the seats of time Louis XVI. Armchairs Louis XVI are generally in lacquered beech, but the polished walnut is also used as the golden wood, reserved for the luxurious models. The mahogany, which spreads under the reign of Louis XVI, is reserved for the chairs of dining room or for the desk chairs. The shape of feet often allows to recognize armchairs Louis XVI: always straight, often slender, they can be sculptured by straight grooves or in spiral, or adopt a shape in baluster. Files evolve with the appearance of files in medallions and openwork files, in particular on chairs Louis XVI and armchairs. The decorative directory privileges the friezes of pearls, piastres, “rais-de-cœur” and the decorations of typical ribbons of the reign of Louis XVI. Sheets of acanthus, pine cones and branches of laurel find themselves on armchairs as on chairs Louis XVI. 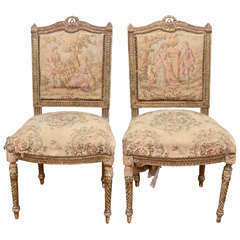 This entry was posted in FRENCH HISTORY, FURNITURES on November 1, 2012 by webmaster.